Clone golf clubs are designed to resemble more notable brands. 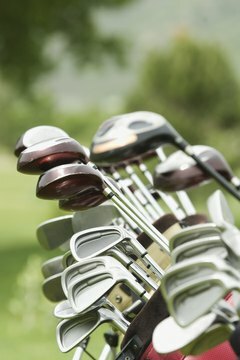 Clone golf clubs typically copy some of the design features and materials of brand name golf clubs such as Callaway, Ping, Cobra, Titliest and TaylorMade. Legitimate clone companies make it clear that the consumer is buying cloned clubs. These manufacturers may offer performance features of branded clubs at more affordable prices. Woods, especially drivers, can be expensive, running hundreds of dollars for those with the latest technology. Some golfers look at clones, which can start from less than $100. Clone descriptions inform the buyer of the design features and components of the club. For example, a driver may be composed of a titanium face and body with movable tungsten and steel weights. Technical specifications will include the loft and lie degrees, face angle, weight and volume. The consumer may be informed of the comparable branded club with similar features. Some clone irons can be purchased as a traditional set, from the 3-iron down to the pitching wedge. The sand wedge, lob wedge and/or gap wedge may be available for an additional charge. Some irons are designed to forgive mishits and promote higher launch angles. Features may include a deep cavity, lower center of gravity, wide sole and lower back weight. There may be a choice of shafts, such as graphite shafts, along with a choice of flex, length and grip. In order to custom build a club with name-brand components, you should know your measurements such as your height and wrist-to-floor distance. You should also know your swing speed, which you can find out at a golf retailer. You may be asked your age, gender, skill level and which club you use from the 150-yard marker. To custom-build a driver, for example, the golfer can select a club-head with a particular loft, head volume (expressed in cubic centimeters), center of gravity, angle, swing weight and face depth. The materials used in the club head body and face can also vary from club to club. A high handicapper should consider a club with a large club face, higher loft and more flexibility in the shaft.